Our colleague Kelley and her husband Brian were giddy with excitement that baby Max was on the way. But gearing up their 1950's ranch style home in Dallas to make room for their bundle of joy proved to be a fun challenge. 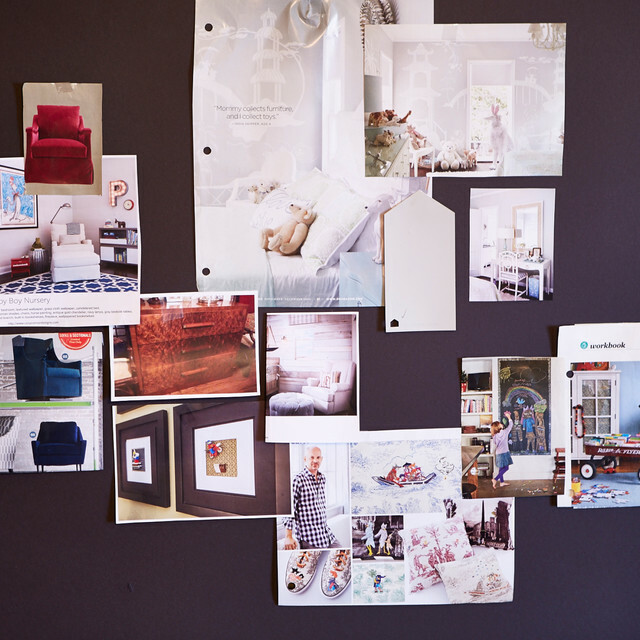 Kelley's inspiration board, full of nursery ideas, painted a picture of a quiet, calm space with cool greys, pops of blues and no signs of clutter - just order and peace. The couple's eclectic aesthetic of mixing contemporary with well-loved antiques would also be important to the personality of the room. 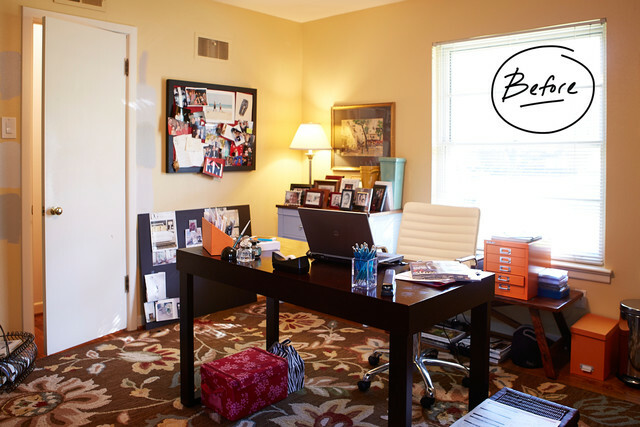 They decided to transform their office space into the baby's nursery, but that meant displacing years of coveted treasures and, oh yeah - finding a place for the home office. 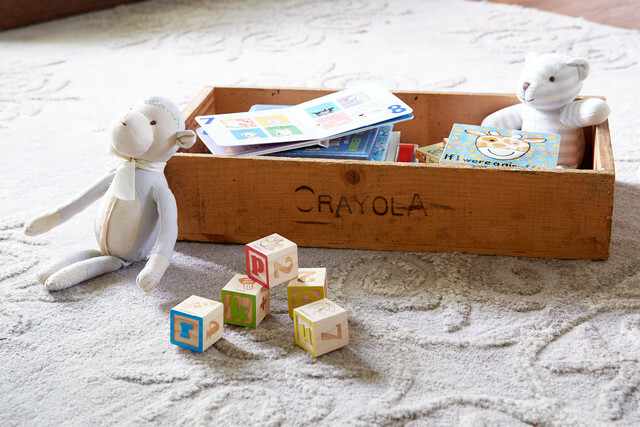 So, like with any organizational undertaking, the couple had to decide what would stay or go, what would be stored in another part of the house and what would be donated or given away. The existing built-in shelving would stay and would be carefully curated. A vintage photo of Kelley's grandfather's grocery store would stay, along with a collection of giraffes the couple had collected over the years inspired by Brian's favorite childhood stuffed animal "Raffy." A Calder print next to the shelving adds the perfect pop of color and a graphic, contemporary touch. Some of their book collection (including Brian's childhood Hardy Boys series) would also remain and would mix with new children's books for the baby. Max is surrounded by all-stars with his basketball signed by members of the 2012 Men's National team - the greats like LeBron James, Carmelo Anthony, Kobe Bryant and Tyson Chandler - some memorabilia from a deal by the Richards Group advertising agency where Brian is a principal. 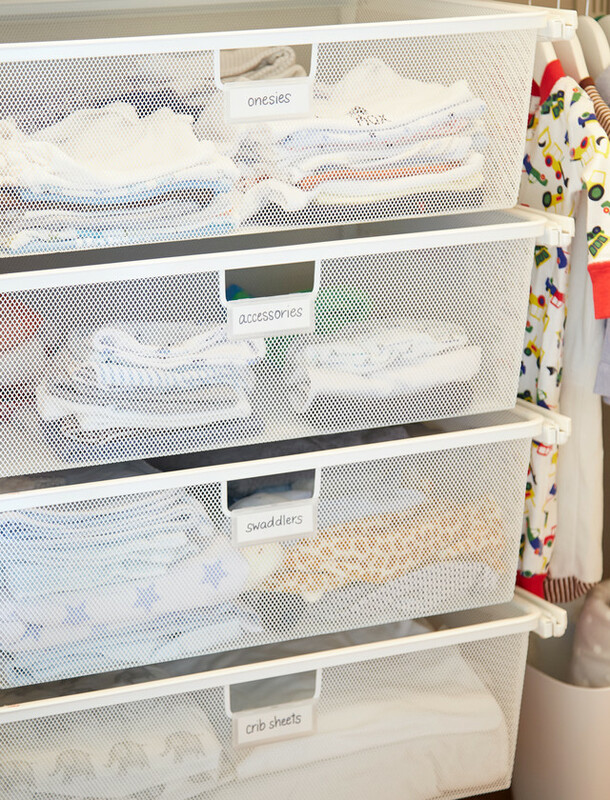 The lowest row of shelves are home to perfectly placed bins that are full of toys for baby Max. The office was relocated to another spare bedroom, which made room for Max's crib and a lot of floor space for playing. 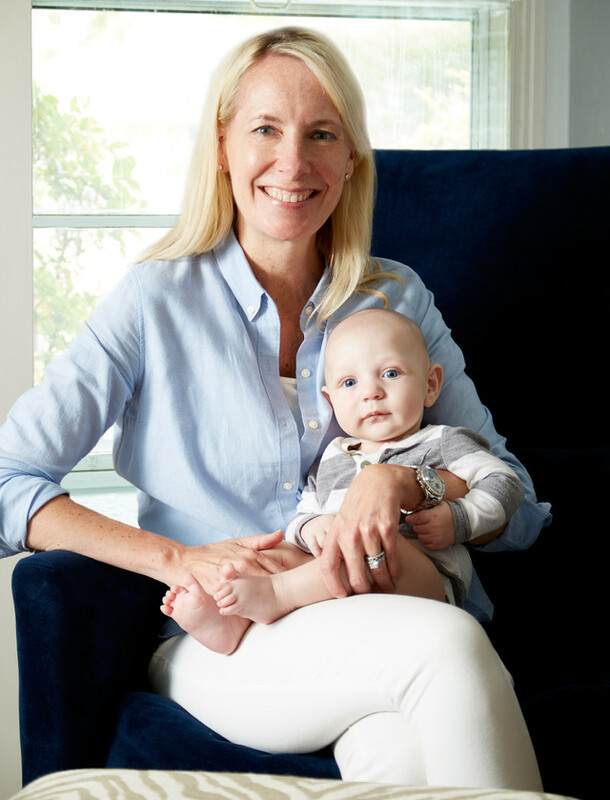 The walls were painted a beautiful light grey (Gray Clouds by HGTV for Sherwin Williams) and served as the backdrop for Max's newborn portraits and other sweet art around the room. 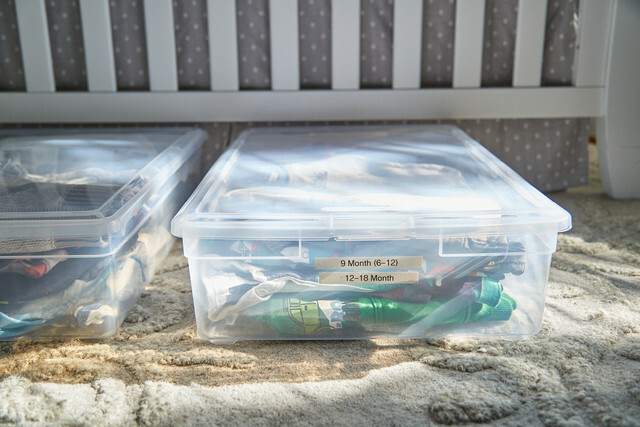 Kelley got creative with her nursery organization and used boot boxes under the crib to store Max's future dapper wardrobe. Labels on each box noted the sizes of clothes in each box. 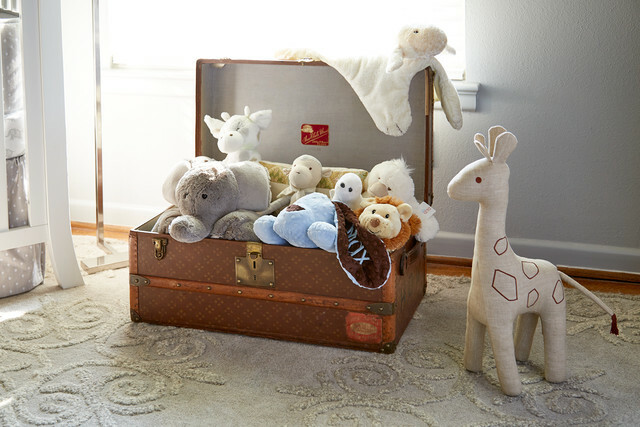 Vintage items like a beautiful leather trunk and a wooden Crayola box store toys and stuffed animals. The antique elements mixed with the clean modern rug and other furnishings provided a nice balance of Kelley and Brian's aesthetic. 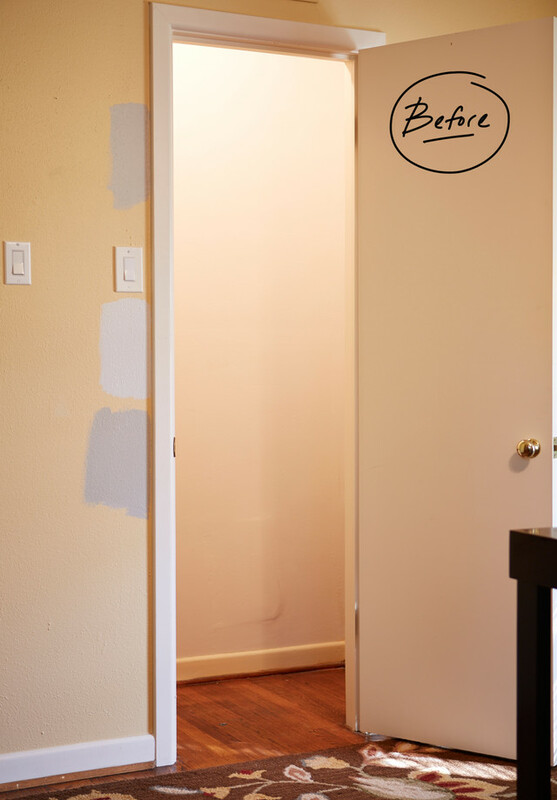 The closet had previously served as an overflow closet for Kelley's wardrobe. Moving it out of the space to make way for Max served as a good time to survey what needed to stay and be stored somewhere else, and what needed to be donated or thrown away. A closet fit for a king! 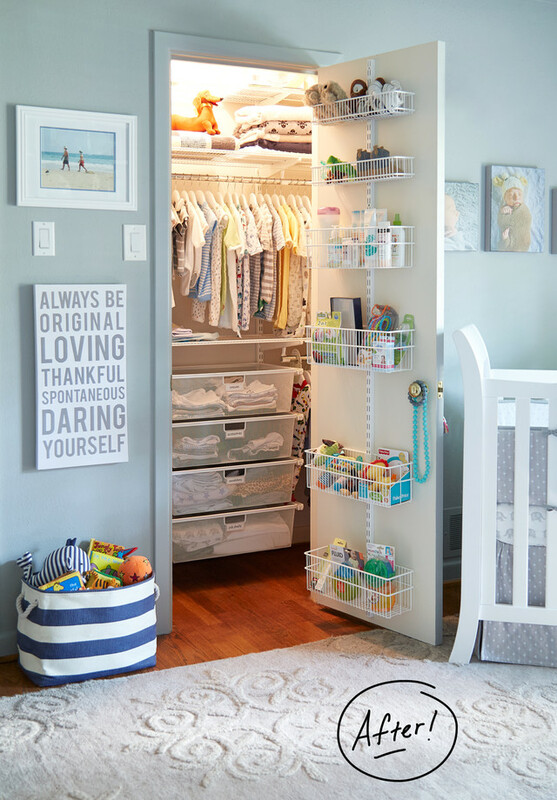 The space is small but mighty with a combination of hanging, shelving and drawer space - perfect for those pint-sized clothes and accessories. Sugar Booger (don't you love that name?!) Children's Closet Rod Dividers separate the clothes by size. 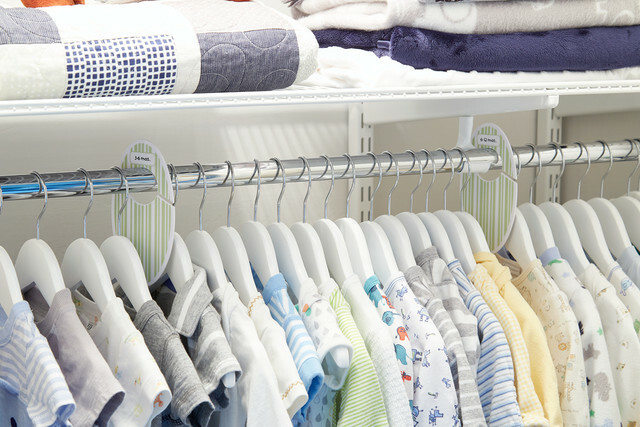 Sweet, wooden children's hangers keep the closet uniform, soft and streamlined. elfa mesh drawers provide just enough visibility and just enough concealment of the items within. Labeling denotes what's stored inside. 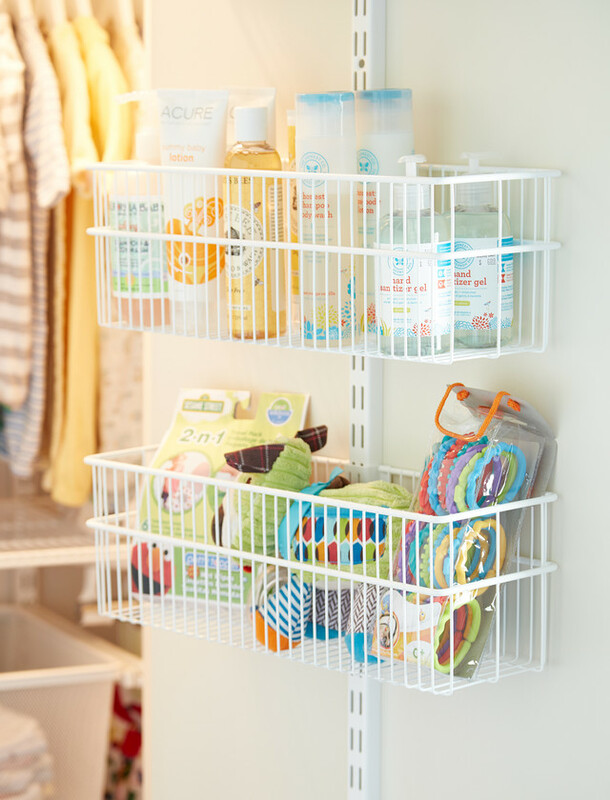 The elfa door and wall rack adds extra storage on the wasted space behind the door, and holds extra supplies and toys. 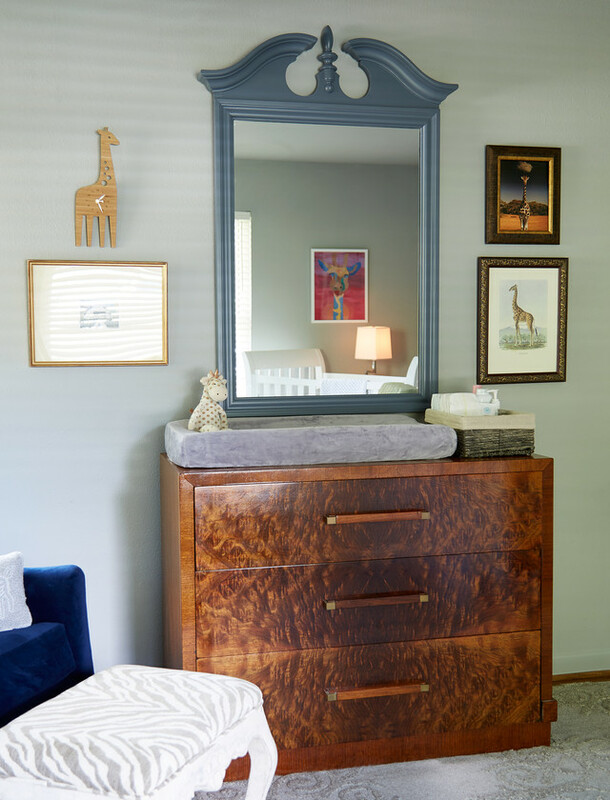 A zebrawood deco chest of drawers was moved from another room into the nursery and does double-duty as a changing table and extra storage for things like diapers, swaddling blankets and burp cloths. 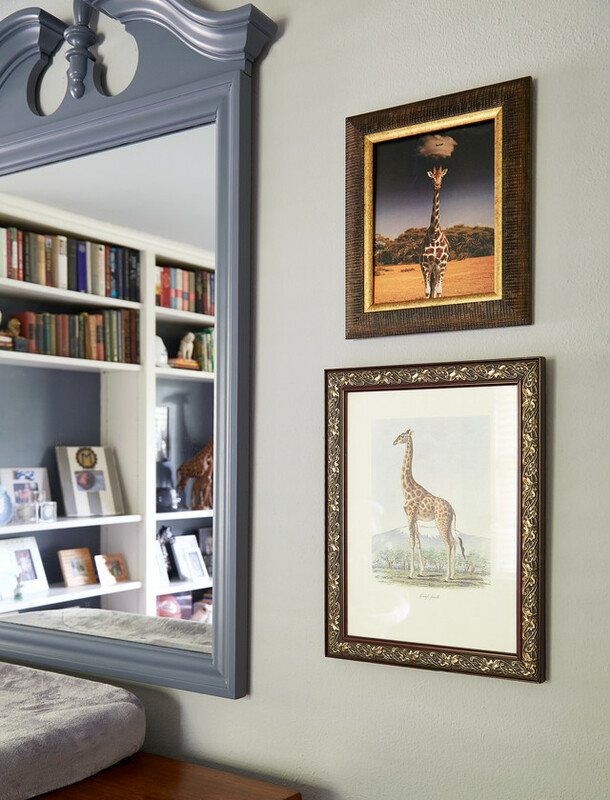 An old mirror that Kelley and Brian found at an antique store and refinished hangs above. 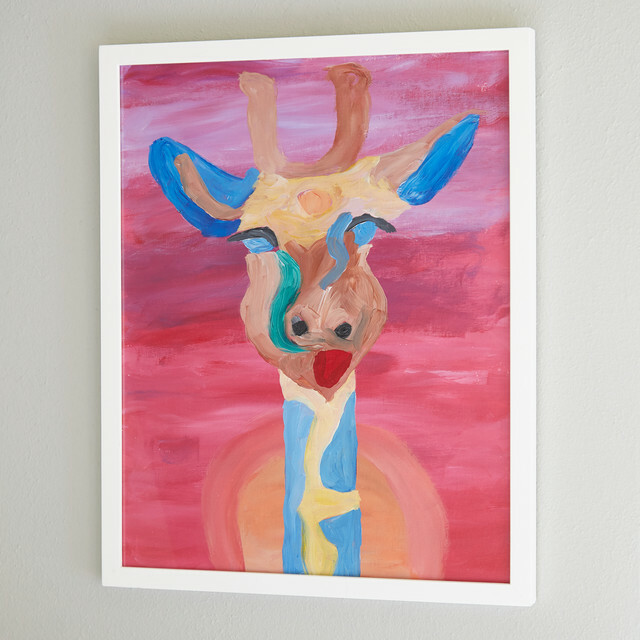 "Raffy" gets a nod throughout the room with artwork of different styles, but we think Max's favorite is the precious, colorful giraffe painting by his "Gigi" - Kelley's Mom. I mean look at that precious baby boy! He's six months old now and looks quite content in his new digs don't you think? And mom looks pretty happy in the space too! "I wanted the room to be serene but not stark and I think we achieved exactly the perfect mix of old and new in the space," Kelley said. "And I think the cozy atmosphere is doing the trick. He's super attentive when he's awake in the space and sleeping through the night. We are so in love with this little boy!" We're pretty smitten ourselves! 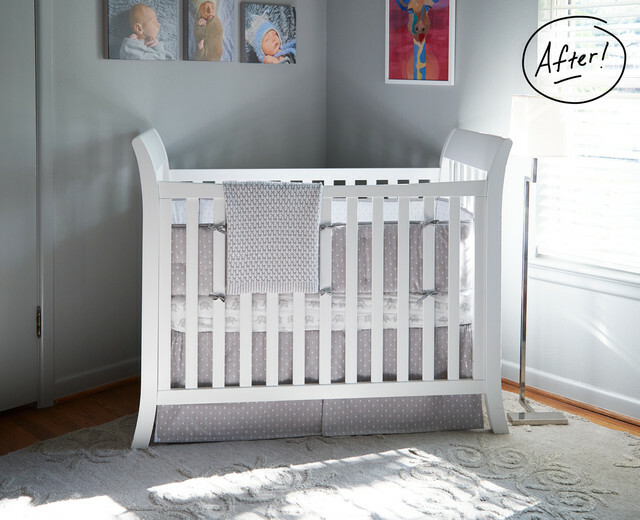 And we can't wait to see how the gorgeous space grows with Max. To check out Kelley's baby shower prior to Max's arrival - read the story here.